A debit card enables the holder to have his purchases directly charged to funds on his account at a deposit-taking institution and can also facilitate the withdrawal of cash from ATM machines. 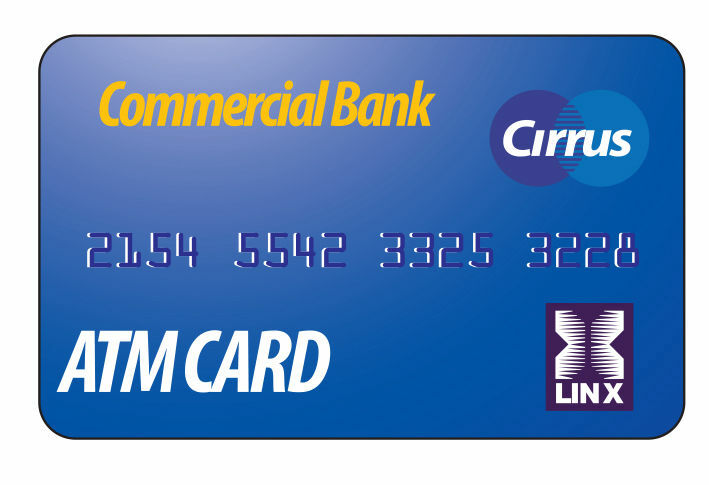 These cards may be internationally or locally branded (for example, LINX). Debit cards can be used to pay for everyday items such as groceries, meals, shopping, etc. With the debit card, you are accessing your own funds as opposed to a credit card which accesses funds loaned by an issuing institution. When you use your debit card to pay for goods and/or services from merchants and service providers, this is called a point of sale (POS) transaction. For this POS transaction, all you need to do is present your card to the merchant who will swipe it through the electronic terminal and enter the amount of your purchase. You are then required to confirm the value of the transaction and enter your PIN (Personal Identification Number). This process creates a debit transaction for the value of your purchase which will be automatically deducted from your account. Are there any transaction limits for the debit card? For your safety and protection, each financial institution sets a predetermined limit to values of both POS and ATM withdrawals. Upon collection of your card, your financial institution will advise you about these limits, the period for which they apply and about the process for renewal of your card. Are there charges for using your debit card? use your debit card at an outlet belonging to another institution (for example, an RBTT customer using a First Citizens Bank ATM machine). If you have a TT-dollar, international debit card issued by a local bank, you can pay for purchases or withdraw cash from an ATM in a foreign country. The TT-dollar equivalent of the foreign currency amount will be withdrawn from your bank account. There is usually a higher charge for using your debit card to withdraw cash. This charge varies with each financial institution. A debit card is a means by which purchases are automatically deducted from a cardholder’s account. When you use a debit card, you are withdrawing money from your own account. Payments made using a debit card do not accrue interest charges because the money is deducted from funds which are available in the cardholder’s account. A credit card is a means of executing payments by drawing on a line of credit with the financial institution that has issued the card. Each financial institution has certain qualifying criteria for issuing credit cards. These include your credit history, income, other debts and the ability to repay. Cardholders are given a period of time to clear their outstanding credit balances. If payment is not made in full by the end of this period, interest is charged on the outstanding balances. The basic difference is that a debit card accesses the cardholder’s money while a credit card draws on the financial institution’s money. • The balance in your account after the withdrawal. • The unused portion of your assigned limit. The assigned limit is set by your financial institution. It refers to the amount of funds you can withdraw within a given period and is automatically restored on expiry of this time frame. You should note that if the unused portion of your assigned limit is greater than the balance in your account, you will be allowed to withdraw only up to the balance in your account. • Do keep your ATM/Debit card in a safe place and never "lend" it to anyone, including friends and family members. • Do keep your PIN private. Your PIN is your Personal Identification Number. Memorize it and do not give it to anyone, even a bank employee. • Do conduct ATM transactions when and where you feel safe. • Do use your hand or body as a shield to prevent others from observing the details of your transaction. • Do remember to take your card and your transaction record after completing your transaction. • Do carefully count the cash received and secure it immediately after making a withdrawal. • Do reconcile your withdrawal slips and LINX receipts against your account statements on a regular basis. • Do report any discrepancies immediately. Missing and/or unfamiliar transactions could be a sign that your card has been used fraudulently. • Do keep your receipts in one place for easy retrieval and better oversight of your account. • Do report lost or stolen cards to your financial institution immediately. • Do report any fraudulent use of your card immediately to your financial institution. • Don’t keep your PIN with your card. • Don’t choose a PIN that others could figure out, such as your phone number or birth date. • Don’t accept assistance from any unknown individuals at the ATM Machine. • Don’t ask anyone to conduct your transactions for you. Using a debit card frees you from the risk inherent in carrying cash. Debit cards may be more readily accepted by merchants than personal cheques. The debit card is a quick, "pay now" product, so that there is no worry about late payments!